Turkish boat charters come in all shapes and sizes. 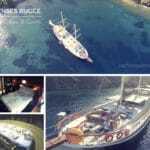 The type of boat charters related to are gulets. Gulets are Turkish wooden boats start offering blue cruise travels from the month of April and go on until the end of October. Sometimes, if weather permits, will continue into the the first half of November as well. 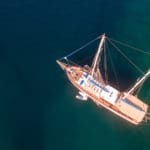 You may not be able to go for a swim (a personal choice), however the gulet cruise itself is a delight to experience in the Mediterranean of Turkey as well as the Aegean Greek Islands. Although many travelers choose to embark on such beautiful seafaring journeys during the warmer seasons, others simply like to enjoy the cruising part and go sightseeing in various harbor and bays for a cultural experience. You can however still get a good dose of Vitamin E on deck, even during the mid fall season. 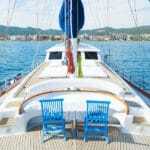 Gulets are both meant for sailing as well as just cruising. 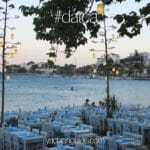 During the one week gulet holiday, sails generally are planned for 2 or 3 days out of that week. The boutique gulets range from 15 meters all the way up to about 25 meters. They do look like little boat charters when out in the open seas; however once the sails come out, these little gulet boats do not seem to look as little anymore. As much as your accommodation is important, where the amenities, decor and design, comfort levels and services are considered, for many the itinerary is just as much important. After all you are spending most of your time on deck, and then some on shore for various on-land activities; such as shopping, excursions, dining, sightseeing, etc. Turkish gulet charters are quite ideal for families, groups of friends, work incentive yacht holidays, executive yacht charters, and hybrid holidays such as bike and gulet cruises. So whether you have a little boat charter – with big sails, or not; a Turkish gulet cruise offers similar itineraries to explore the wonderful treasures of the Turkish coastline and the amazing Greek Islands.